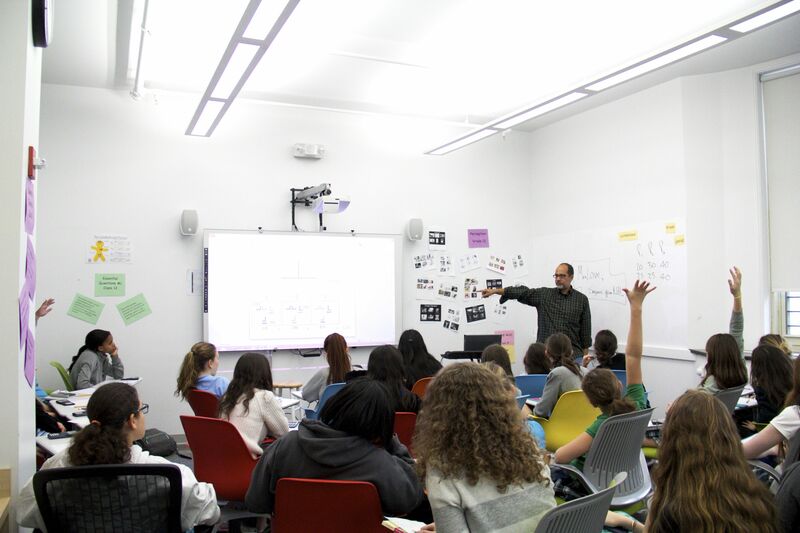 “Engineers make lots of mistakes,” civil engineer Mark Love noted to Class 8 students when he visited them for a guest lecture on traffic signals. The process of finding a solution to a problem, he explained, requires a great deal of work, the constant review of one’s calculations, and a backup plan. To illustrate his points, Mr. Love presented the students with a problem that involved ten lanes of traffic converging at one intersection. How could the lights be timed so that no cars collided? Using a 90-second cycle for each lane, Mr. Love showed the girls how to compute the flow of traffic during rush hour. One student suggested that the lanes frequently queued up with the most cars should be allowed to make a turn first. Mr. Love agreed with that student’s idea. The guest speaker then showed the students how to input variables into an algebraic equation to find the solution to the traffic cycle. “This has been an algebra lesson disguised as an engineering lesson,” he told the students while they worked in small groups on the equation. Later, students went up to a whiteboard to write down their answers and get feedback from Mr. Love. “Reducing traffic congestion, and gas usage, is good for the environment and it’s good for the economy,” he told the class once they finished. One student said it seemed as if the lights on some of the avenues were timed. Mr. Love said that this was true. “There’s no point in rushing to the next light—relax, it’s all timed. You’ll get there,” he said.